Who doesn’t love getting new beauty products? But let’s be real, trying out new products can also get a bit out of control. Walking through Sephora often feels like a beauty landmine, especially by the time I make it to the checkout line where I am tempted with all of the cute little minis and travel sized products saying, “take me home, I’m so cute!” or “look at me, I’m just an innocent little travel sized cutie!” So I pop a few in my basket without even thinking about it. And then by the time I check out, I quickly realize that those innocent little cuties can be upwards of $35. Yikes. So for me, it’s all about the balance. Splurge in some areas and save in others. And saving is exactly what we are talking about today. 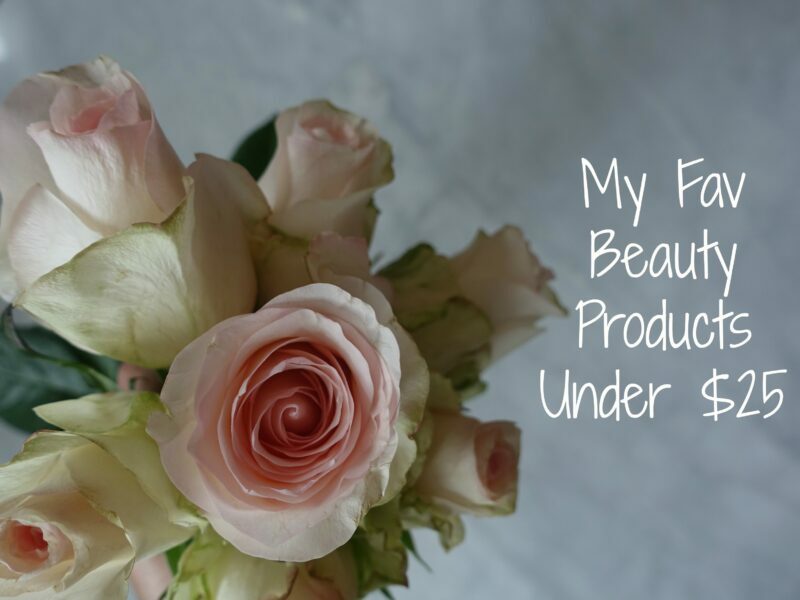 I’ve pulled together my favorite, tried and true beauty products under $25 that I have continued to use over the years, even when some new and more expensive products have come in and tried to take their spot. But nope, so far nothing newer or shinier has taken the place of these 6 items. 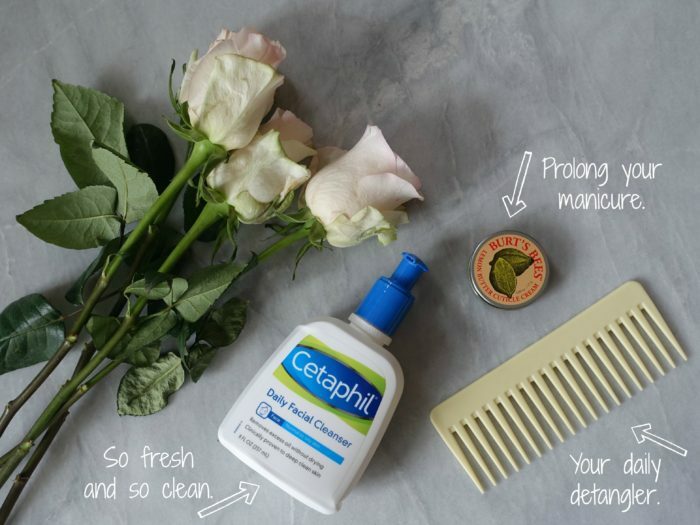 Cetaphil Daily Facial Cleaner: I’ve been all over the map when it comes to cleansers – I’ve tried more expensive products, drug store products and even As Seen On T.V. products. But lately, I keep coming back to Cetaphil. It’s gentle on my skin, but also leaves me feeling refreshed and baby soft. Burt’s Bees Cuticle Cream: I would be lost without this product. Seriously, it is probably my favorite beauty item in the house. My Aunt had told me about it a bunch of years ago, and ever since, I’ve been hooked. Since I do a lot of cooking and projects with my hands, I am constantly washing them which can lead to dry hands and cuticles really quickly. But when I put a little shmear of this good stuff on my finger nails and cuticles before bed, I literally wake up with fresh hands – whether polished or not, my fingers look and feel 100% better (and like I just got a manicure). Macadamia Healing Oil Infused Comb: My sister-in-law brought this back from Hawaii for me a few years ago and I have absolutely loved it ever since. Since I didn’t always have long hair, I never really dealt with tangles. But since I grew my hair out, tangly hair has been tougher to tackle. Supposedly there are some nut oils in this comb which help to de-tangle hair. I can’t tell you exactly what is in the comb, but what I do know is that it gently works the tangles out of wet hair, and that is a big win for me. Batiste Blush Dry Shampoo: Finally a dry shampoo that I can stand by! Long have I desired a dry shampoo that worked well and that I also thought smelled really nice. Believe me, I have been around the block with trying out dry shampoos. But luckily while we were in Spain, I saw this budget friendly option at Primark and decided to pick one up and give it a try. To me, it smells faintly of Hawaii and plumeira or gardenia flowers. But not in an over-powering yucky kind of way, in a gentle breeze of fresh cut flowers kind of way. And it works great too. It’s not heavy at all (but erases the oil build-up) and it blends into your hair really well. On one of my first uses of it, some one complimented me on my perfume. Hahaha! Thanks, but it was actually my dry shampoo. Definitely a success. 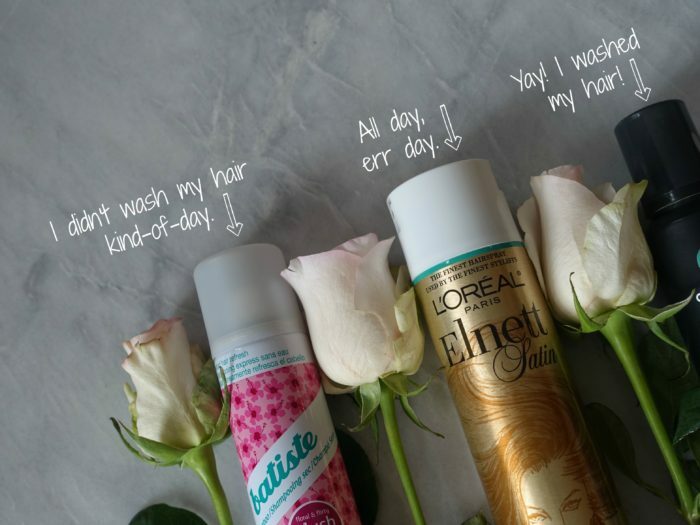 L’Oreal Elnett Satin Extra Strong Hold Unscented Hairspray: Long gone are the days of crusty, lifeless, overly-shiny, crispy crunchy hair. This amazing hairspray has a strong hold, but at the same time leaves no trace of product. And…it combs out! If you run your fingers through your hair, or comb or brush it, it gently loosens the hairspray without leaving any white residue behind. Hallelujah! Goodbye crunchy lifeless curls of the ’90s, hello beach waves and bouncy healthy looking hair. Paul Mitchell Awaphui Wild Ginger HydroCream Whip: Mmmmm. The smell of this alone gets me. The first time my stylist used this on me, I was like, “what is that?! ?” And I seriously get complimented on the scent all. the. time. Even if I don’t have time to style my hair and am running out of the house with wet locks, I run a little pump of this mouse through my hair to help it air-dry with a little more shape. And the plus side of this product with either styled or un-styled hair, is that it gives my hair the yummiest scent. But for days when I am styling, this stuff is pure gold. It provides excellent hold for a blowout or style, and keeps my hair feeling (and smelling) yummy all day long. 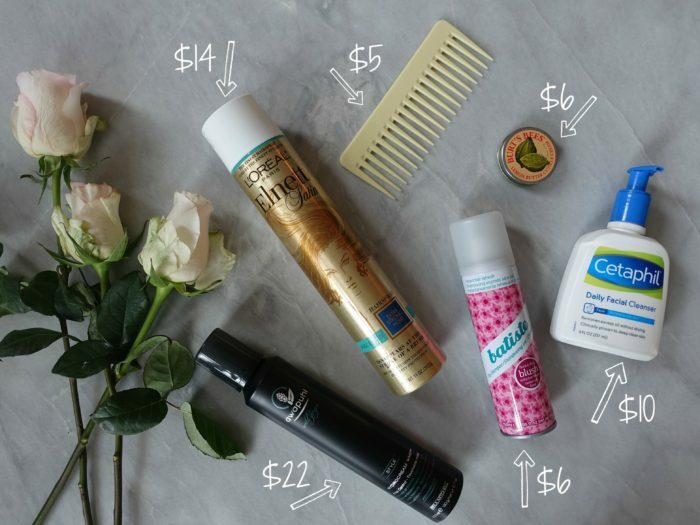 What are your favorite beauty bargains? Do you have any products that are your tried and true? I love your photo comments! They’re just adorable! Wonderful post as always! I am partial to Dr. Andrew Weil products. Why? Hopeful wrinkles will go away, but still awaiting that miracle. I’m going to pick up the Batiste just because the bottle is so cute!